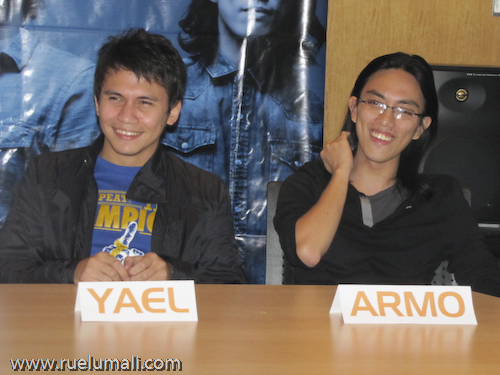 Diamond-recording band Sponge Cola new album’s titled Araw Oras Tagpuan—date, time, place launched at Universal Records Office last October 20. 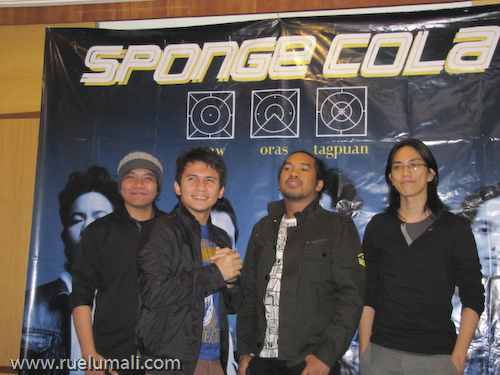 All throughout the years, Sponge Cola did not stop producing top chart singles like Jeepney, KLSP, Gemini, Bitiw, Tuliro, Movie, Pasubali , Ayt!, Makapiling Ka, Di Na Mababawi and the famous UAAP Theme Song “Puso”. From then on, the band’s popularity doesn’t seem to be waning. It was evident from numerous awards and citations received by the band. From favorite artist to favorite song to favorite group to favorite rock video to favorite vocalist to achieving gold and platinum awards, Sponge Cola’s rise to full stardom never stops, and it shows no sign of flickering. 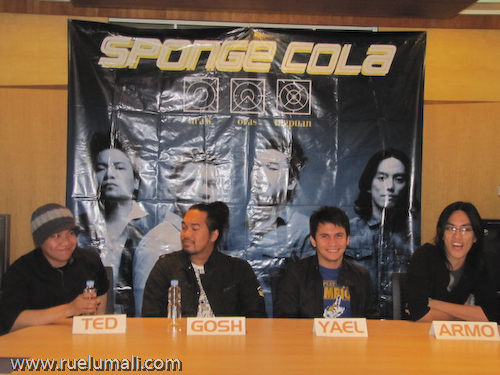 Sponge Cola reached their diamond phenomenon status after Eraserhead for their outstanding sales of Tambay (EP) via Coca-Cola’s summer promo. It was a privileged to witness personally the band casually talking and mingling with fellow bloggers. 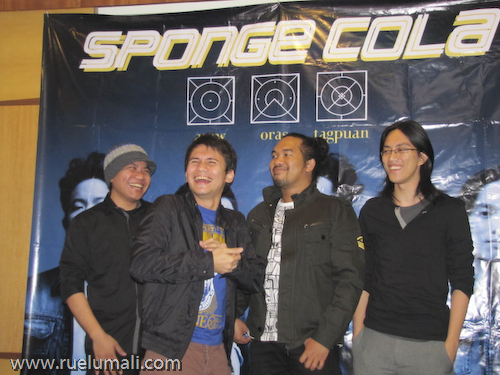 Through interaction with the group, Sponge Cola is not afraid to experiment and take the music to different places that make them successful and be around for how many years. “This is just how we are. We do whatever we want to go, making music is what we do. We keep it real. We’re all about the fun. Araw Oras Tagpuan consists of 12 tracks that include massive hits Tambay, Regal and the new hit single Kay Tagal Kang Hinintay. 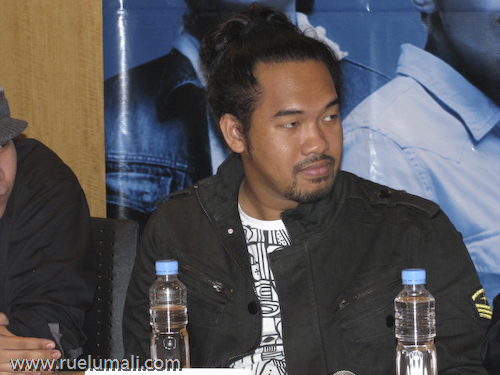 Other songs included are Walang Wakas which became the theme song of ABS-CBN’s series Wansapanatym: Rod Santiago’s Buhawi Jack; New Steel which features Paolo Valenciano of Salamin, Ria Redulla, and Los Magno of Out of Body Special; and Warning featuring Norma Love, Iwa Motor, and Mowmow of Tanya Markova. 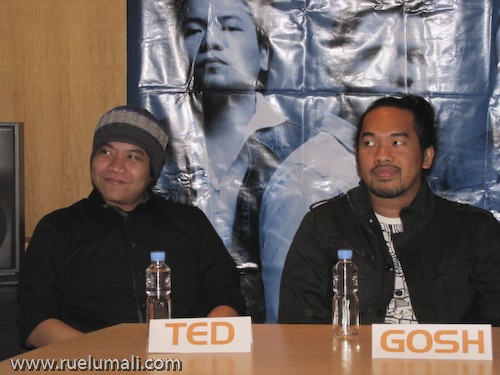 In this album, nine out of twelve songs were mainly written and co-written by Yael along with Gosh. It is interesting to note that the collaboration with these artists adds hip hop, new metal, and retro to the band’s definitive music. The album Araw Oras Tagpuan is out now in all major record bars nationwide under Universal Records. 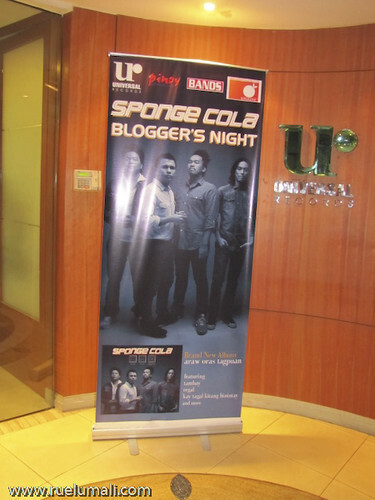 Thanks to Universal Records in bringing up the “Sponge Cola’s Blogger’s Night” in cooperation with Pinoy Magazine and BANDS Magazine. Thanks also for an invite courtesy of Orange Magazine TV – their official online partner. 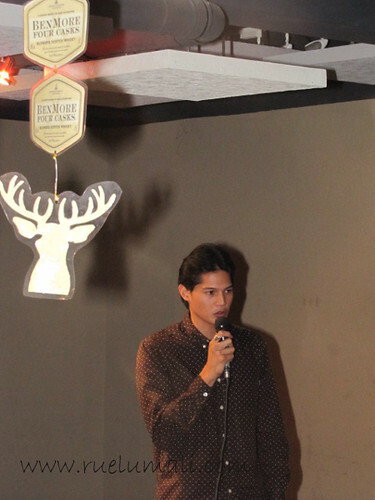 Lastly, special thanks also to Coca-Cola Philippines. 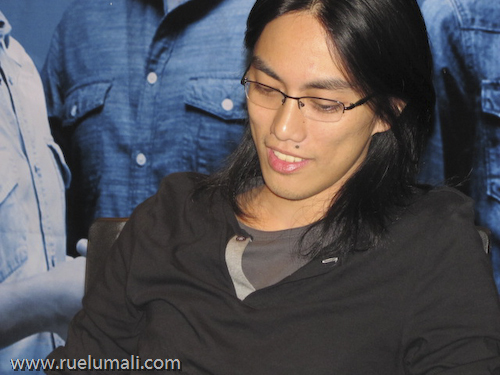 Note: To access Sponge Cola’s ring back tone of Kay Tagal Kang Hinintay just text UD089 to 2332 for GLOBE users and text FKAY to 2728 for SMART users. I got the chance to visit their branch last summer near Molito Alabang and now have to witness again another openings here in SM Las Pinas. 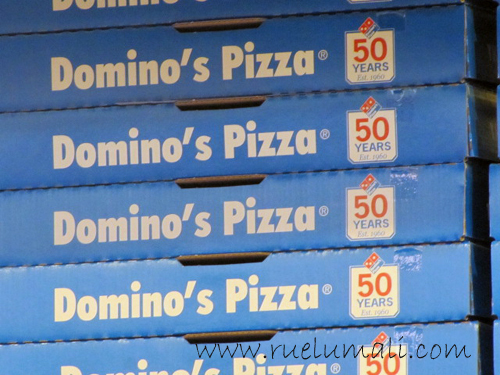 Domino’s Pizza is 50 years in the pizza business which known for no. 1 worldwide in pizza delivery. 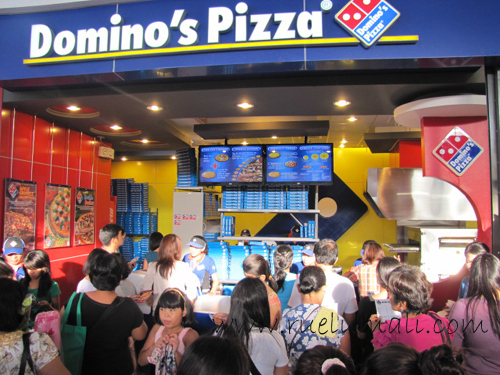 Domino’s is famous for warm, soft crust with the right amount of crunch and toppings that will satisfy every cravings. 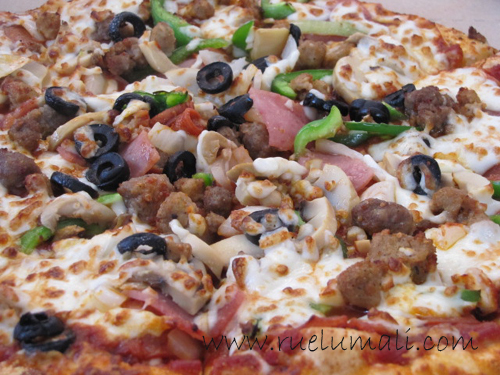 The best seller – ExtravaganZZA where all the toppings in one pizza from ham, beef, Italian sausage, onions, green peppers, mushroom and black olives. 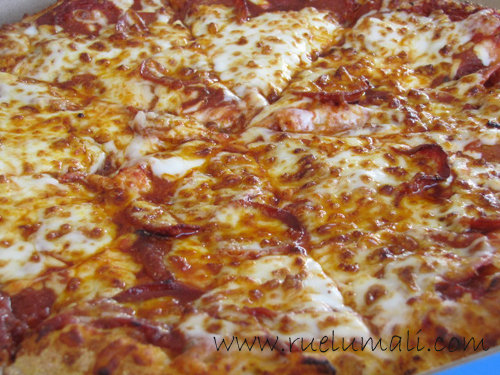 Cheese Mania flavor is very light that is bursting with flavor of lotta of mozzarella cheese. 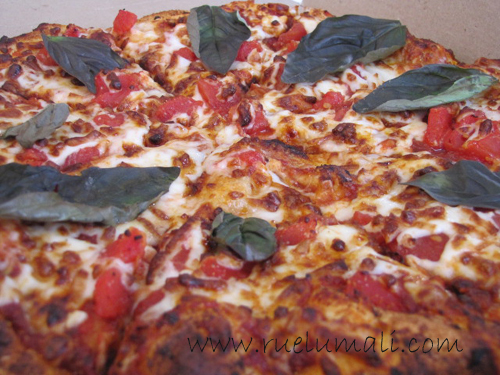 This the veggie pizza of Domino’s – Margherita where pizza sauce and mozzarella cheese are topped with ripe, juicy tomatoes and basil leaves. 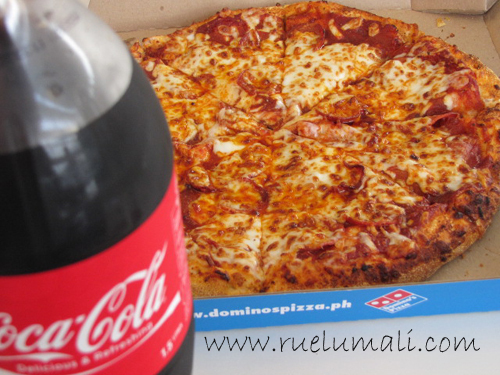 Domino’s is best served with ice coke. 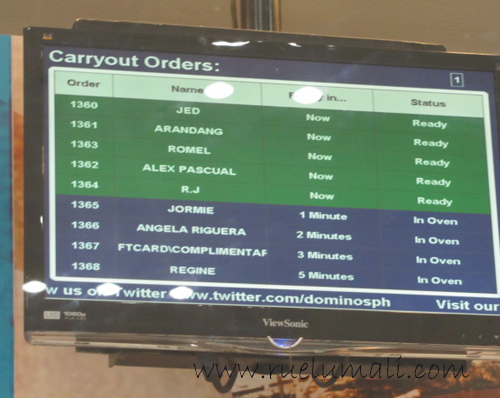 Below is a viewing screen that monitors the status of the ordered pizza located in the dining area. 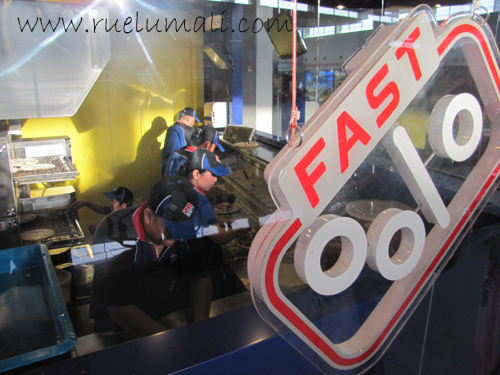 Domino’s Pizza delivery 30-min guarantee! Domino’s Pizza is giving the pizza delivered within 30 minutes or YOUR PIZZA IS FREE. 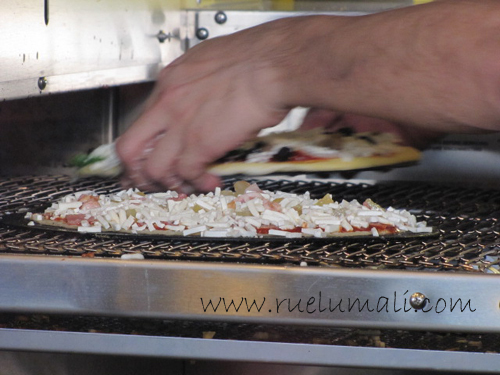 According to them, pizza should be enjoyed within 30 minutes when it is still hot, fresh and crunchy. 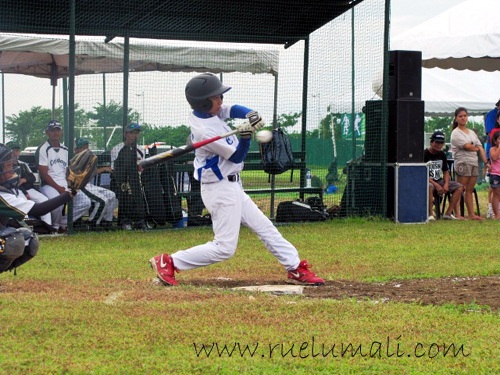 Last September 24, family have the time to do some bonding at Nuvali, Laguna and found out that there were events around. 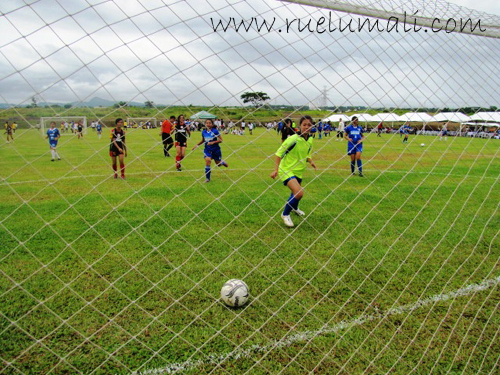 There was this activity called – Nuvali Cup 2011: Legends Rising – an annual event designed to promote healthy active living through outdoor sports and encourage sports excellence featuring different schools and leagues battling it out in football, baseball, and touch football. 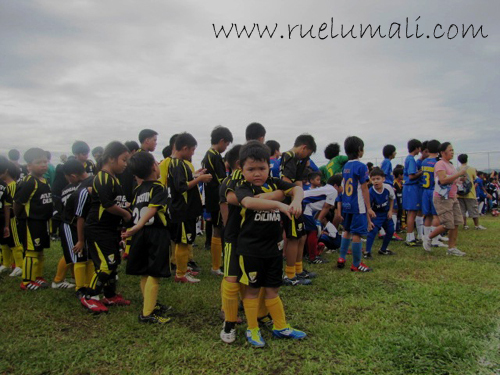 Have seen different clubs and schools competing like De La Salle Zobel, Paref Southridge, Paref Woodrose, Ateneo De Manila, Canlubang Little League, De La Salle Lipa, Alabang Tigers, Brent, UP Diliman, Faith Academy, Nomads, Makati Football School, Manila Soccer Academy and more. 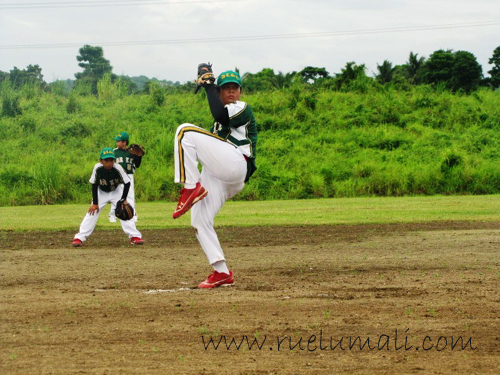 The event also featured performances from the Freestylers and key members of the country’s national teams the Baseball Philippines, Philippine Azkals, and Philippine Volcanoes who lead the sports code pledge during the opening ceremony. 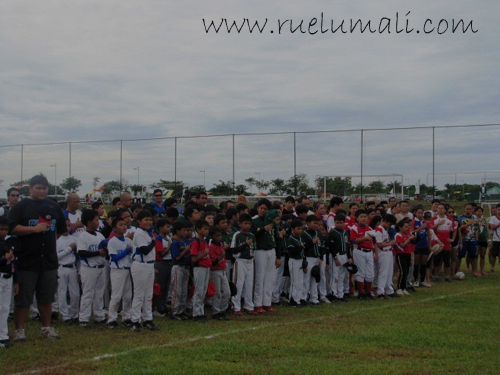 This event featured over a thousand sports legends in the making where our family enjoyed watching epic sports fest battling to win the Nuvali Cup. 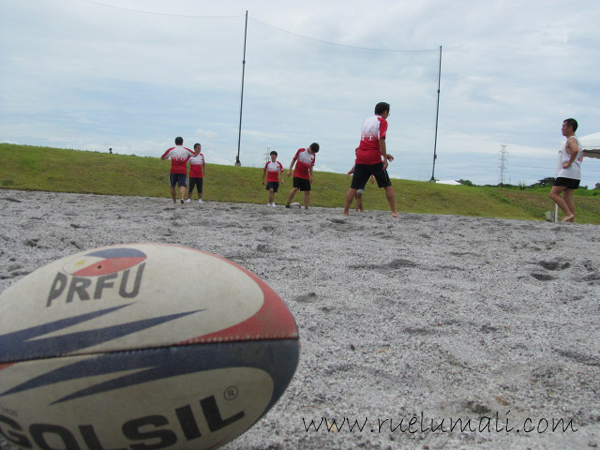 To know more about Nuvali, visit www.nuvali.ph or call 0917-5ASKNUV (275688). 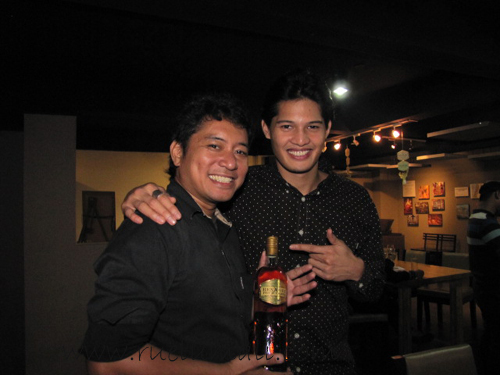 This is my first time to attend a liquor event that would meet personally the endorser, Borgy Manotoc at the Wine Museum in Pasay City. This event would also remind me how to drink responsibly and must be served to 18 years of age to consume the product. 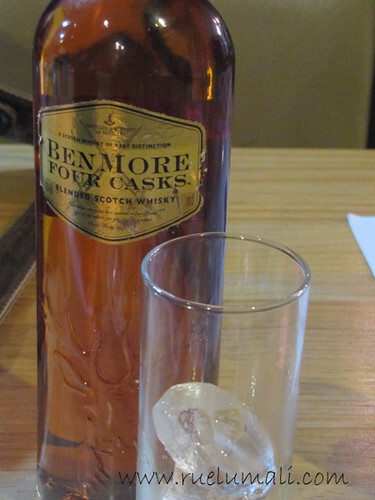 BenMore Four Casks Scotch Whisky is the newest whisky that is produced and distilled in Scotland. It is a deluxe Scotch whisky which puts attention to details. It is matured in four different types of oak casks to achieve depth and complexity to match the standards of whisky drinkers, to give the harmony between mellow tastes and scotch aroma, including malt and peat aroma with the hint of smokiness and most importantly, to give you an even smoother Scotch whisky experience. Expert blenders have chosen 21 of the finest whiskies to include in the oak casks. The sherry casks create a richness that you will savor. The bourbon casks give the liquid just the perfect hint of woodiness and the charred casks provide the ideal level of smoothness. Finally, the refill casks produce BenMore Four Casks’s signature complexity appreciated by true Scotch whisky connoisseurs. The iconic stag – to represent heritage and authenticity. It connotes masculinity, superiority and leadership. 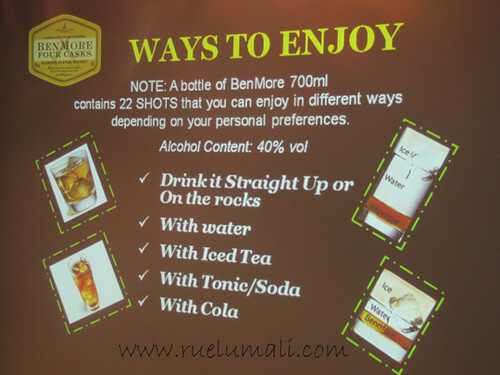 Consumers drinking BenMore will be perceived as smart, stylish, presentable and tough. They know what they want and are a go-getter; but they’re also friendly and open-minded, exactly like the Brand Ambassador, Borgy Manotoc. BenMore Four Casks offers an even more deluxe scotch whisky for greater drinking experience with smoother and more complex whisky notes which regular standard whisky cannot offer. It’s more affordable compared to other brands of whiskies. Suggested retail price is Php335 – 385, may vary depending on location. 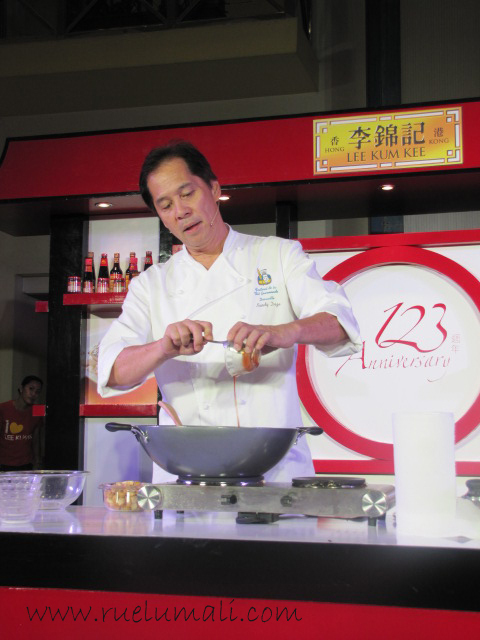 Lee Kum Kee, the leader in authentic Chinese sauces is celebration 123 years of giving superior quality products to every home. 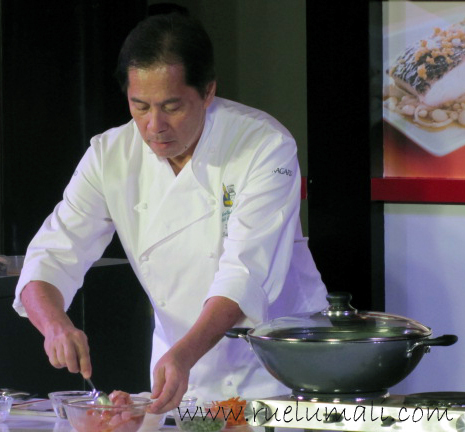 Last August 28, mallers like me had a chance to witness Chef Sandy Daza as he shared his culinary expertise and their specially created Lee Kum Kee recipes for the weekend cooking festival. 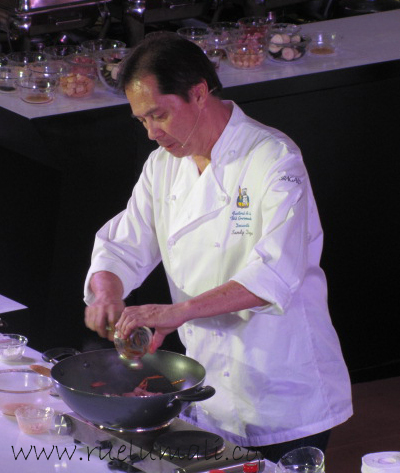 Not a stranger in giving tips and sharing his kitchen secrets, Chef Sandy Daza returns to the Cook with the Master kitchen and amazed the audience with his quick and easy Lee Kum Kee recipes. Lucky audience members of the cooking demo also got to show their skills in the kitchen and the stage with Chef Sandy cooking the special recipes as well. 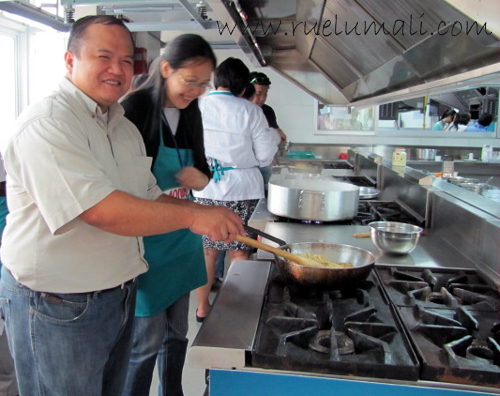 Chef Sandy shared the step-by-step process of the recipe. 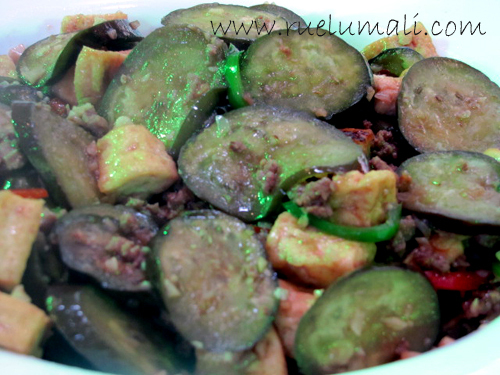 The first healthy dish was the Sauteed Tokwa at Talong mixed with different Lee Kum Kee sauces. 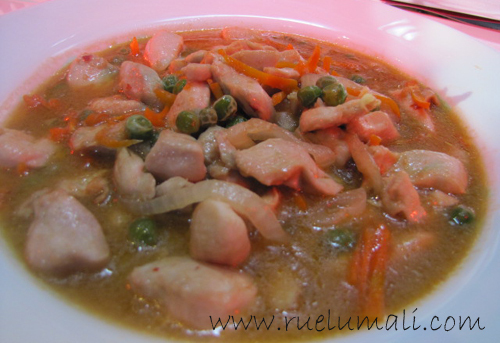 The second dish was Lee Kum Kee Chicken in Oyster Sauce. 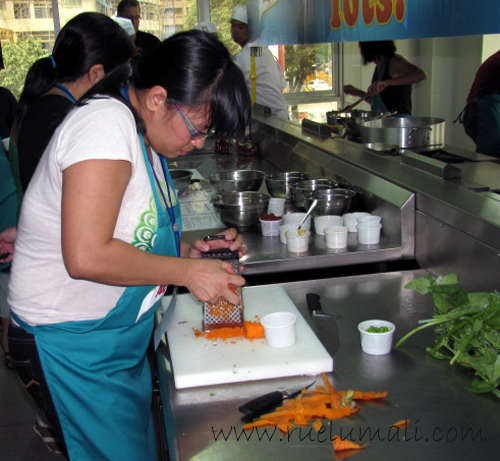 The audiences got also the chance to taste all the food that was cook. 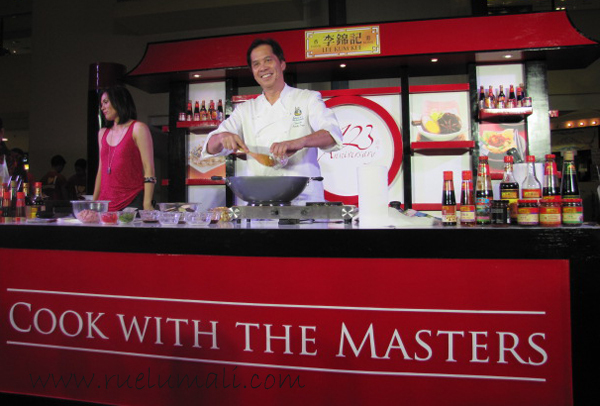 There will be more Cook with the Masters legs coming to the mall near you. 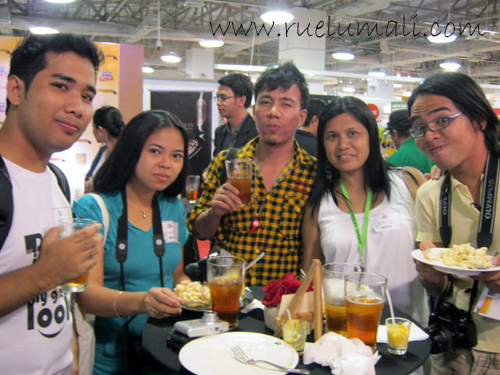 Visit appetite.ph for more details. As parents introduce their little picky-eaters to a wider variety of healthy foods, they need to remember that in the meantime, they need to make sure that their kids are still getting their daily dose of much-needed nutrition. A great way to do this is by adding milk to the menu – milk that not only has the important nutrients they might be missing out on but also tastes good. 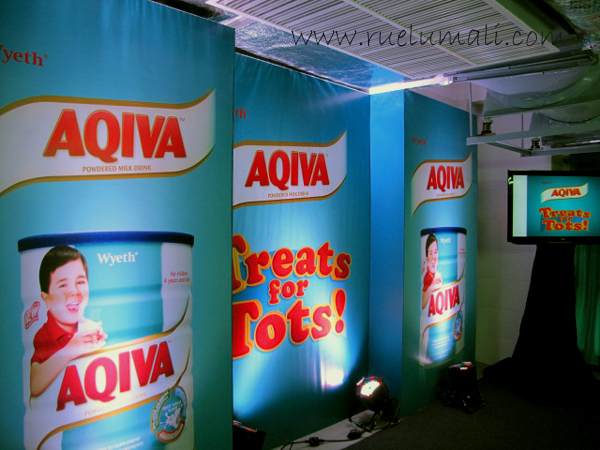 AQIVA, a nutrient-enriched milk supplement from Wyeth, the country’s leader in pediatric nutrition, is designed to fill the nutritional gaps of children 4 years and older. 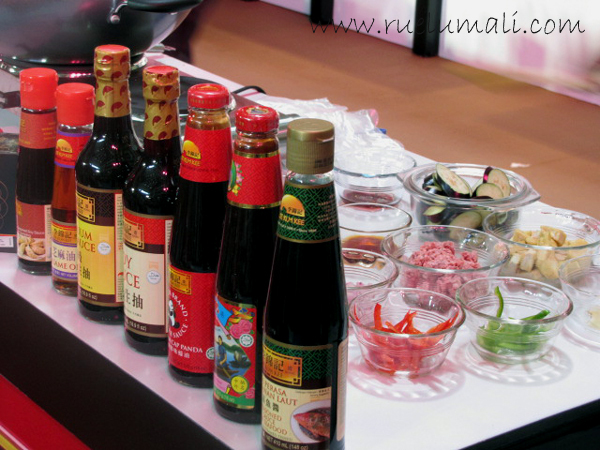 It is formulated with Adequate, Quality and Important (A.Q.I.) nutrients that help ensure balanced nutrition. AQIVA contains more than 40 ingredients including 25 essential nutrients, to help provide a growing child with proper nutrition at the stage when his diet is not always nutritionally complete. AQIVA also comes in a great-tasting vanilla flavor. 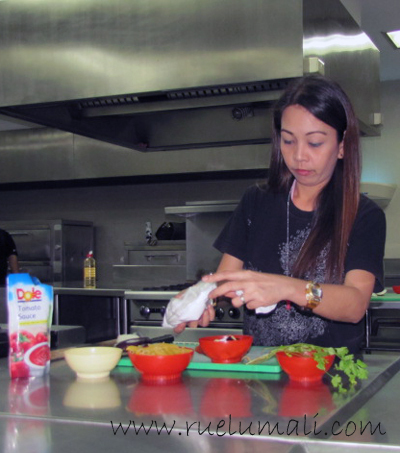 To help equip parents to provide healthy and fun to eat food options to their children, culinary expert Chef Carina Guevarra shares some meal recipes that are nutritious yet appealing to kids’ appetite. 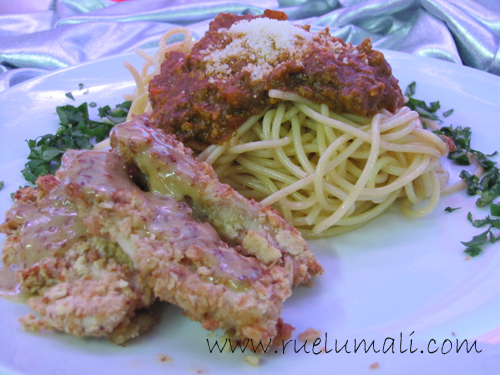 She recommends “Healthy Spaghetti” and mouth watering “Baked Fish Fingers” meals which the guests have the chance to prepare the dishes on their own. Who would say that this spaghetti have spinach, broccoli and green peas? 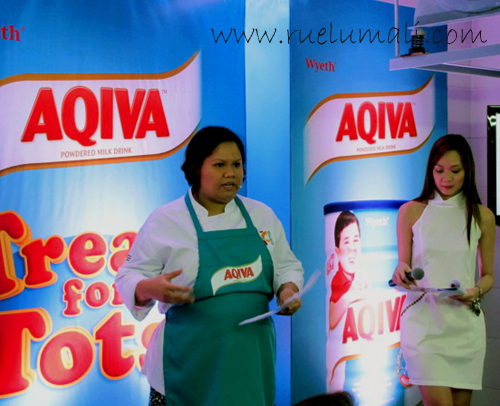 For more information and tips on healthy eating for children, parents can log on to www.facebook.com/AqivaPH or contact the Wyeth Careline at 81-WYETH (81-99384) for Metro Manila and 1-800-10-884-2222 (toll-free) for provinces. 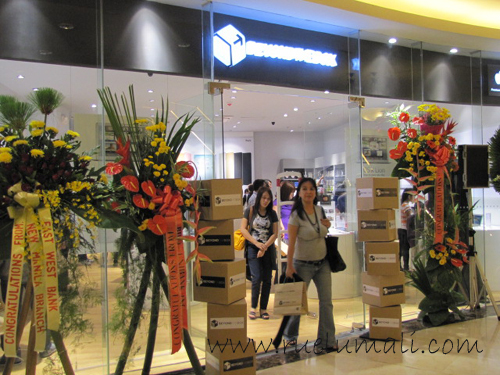 Beyond the Box launched its new Apple Premium Reseller store at the Newport Mall, Resorts World Manila last August 26, 2011. The new store offered shoppers in Pasay City the opportunity to learn and experience Apple’s innovative products and solutions in a welcoming environment. The new store offered a complete range of Macbook Pro, iMac, Macbook Air, Mac mini, Mac Pro, iPad, iPod, iPhone along with a wide range of accessories. At Beyond the Box, a new Apple Premium Reseller in Pasay City, knowledgeable experts were available to help visitors learn about all the latest products from Apple including the magical iPad 2™ which let users browse the web, read and send email, enjoy and share photos, watch HD videos and much more. The all-new iPod touch® featured a stunning Retina™ display, FaceTime® video calling, HD video recording and Game Center. Visitors of Beyond the Box also tried the new MacBook Air®, Apple’s lightest and most portable notebook ever, and the revolutionary iPhone® 4, the world’s thinnest smartphone with the highest resolution display ever built into a phone. 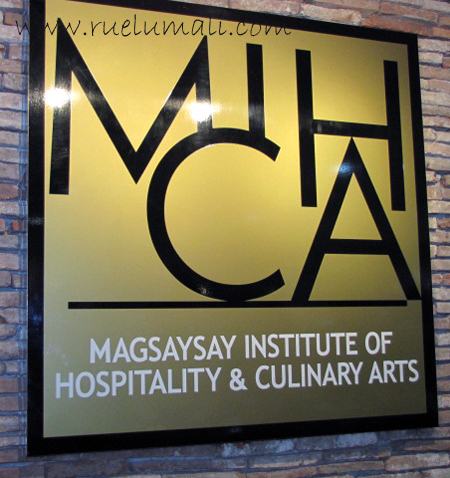 Held on August 26 at the Magsaysay Institute for Hospitality and Culinary Arts (MIHCA), the Great Dole Cook-Off was an experience to see delectable dishes preparing in your own eyes. 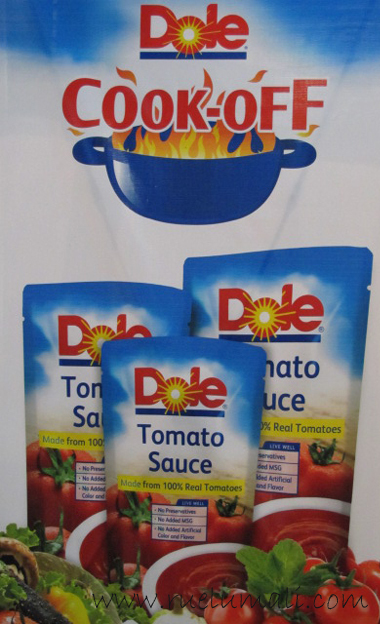 Dole held the Great Dole Cook-Off that launched the brand’s line of tomato sauces through an exciting cook-off among guests. 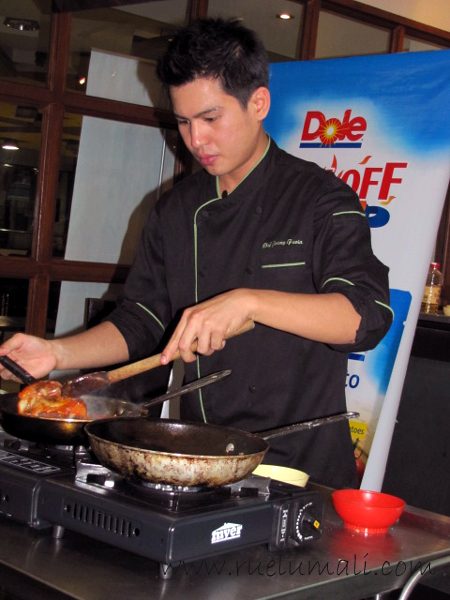 Chef Jeremy taught and prepared easy-to-cook succulent culinary delights with Dole’s line of tomato sauces with a cooking demo. 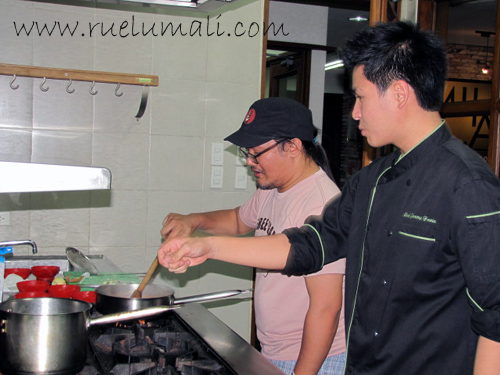 After the cooking demo, it was time for the guests battling out their cooking skills. 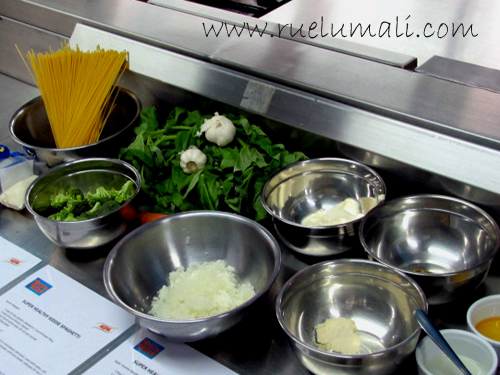 Contestants were able to try the dish – Cherry Tomato and Ragu Penne as tomato sauce was the theme ingredient. 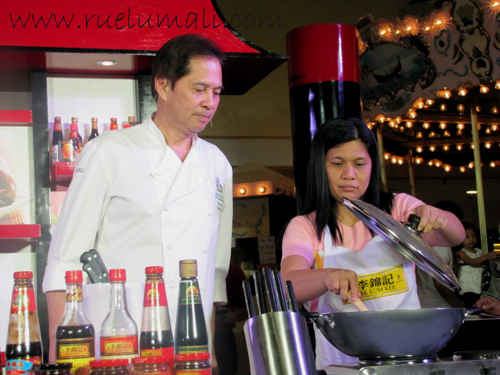 Chef Jeremy has a hard time judging this culinary clash but in the end there will be reigning one winner who got the most watering taste dish. 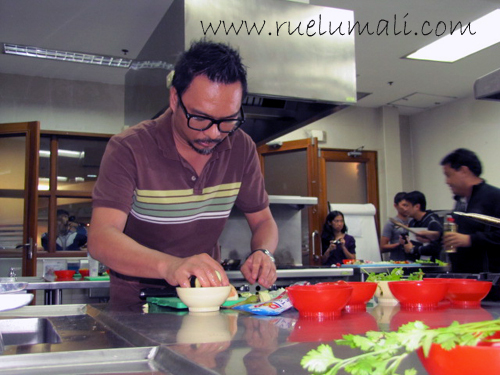 Overall, the Great Dole Cook-Off got the time to learn and taste healthy yet gastronomic dishes. Again, thank you Dole! 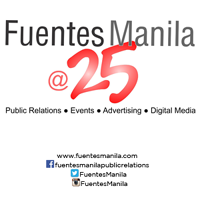 The Commission on Filipinos Overseas, Duty Free Philippines, Good News Pilipinas and Kraft Asia and Toblerone are stepping up to the challenge by announcing the opening of nominations for the first Thank You Global Pinoy Awards. The Thank You Global Pinoy Awards is an initiative that seeks to search for the most outstanding global Filipino workers who deserve the gratitude not only of their loved ones; but also of the nation as a whole. 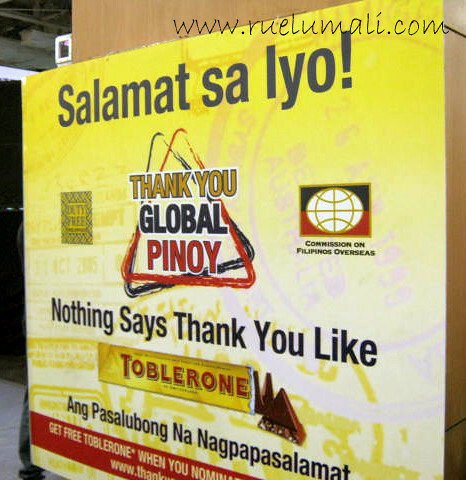 It is primarily led by the Commission on Filipinos Overseas (CFO)—the government agency tasked to promote and uphold the interests of Filipino emigrants and permanent residents abroad and Toblerone as the key proponent of Thank You Day in 2007. We are glad to personally witness the said Global Pinoy Award project last August 26 at Duty Free Philippines as a support for the noble cause to our overseas Filipino worker. They got this picture booth around and post it message writing your own note of gratitude. 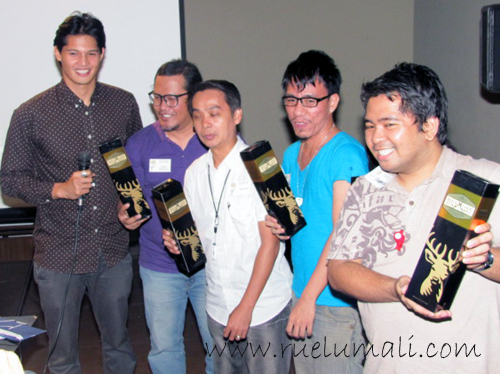 A purely below-the-line initiative, the Thank You Global Pinoy Awards will invite nominations of outstanding overseas Filipino workers who deserve to be thanked. 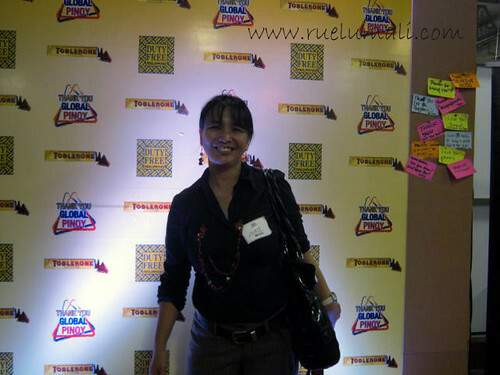 For more information, those who are interested to join will have to log on to www.thankyouglobalpinoy.com to register, nominate and vote for the ultimate Global Pinoy. The top 10 stories will be awarded in January 2012. So good luck! 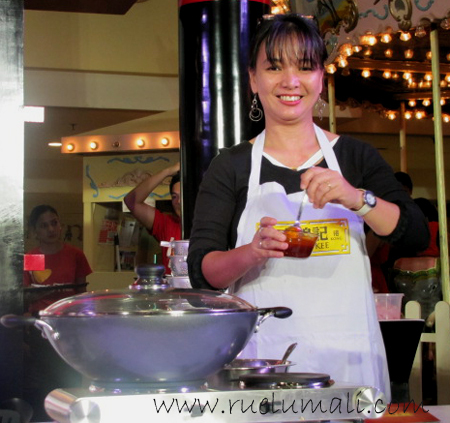 Got the opportunity to attend the launching of new breed of corned beef last August 25. But what makes it different with regular beef? 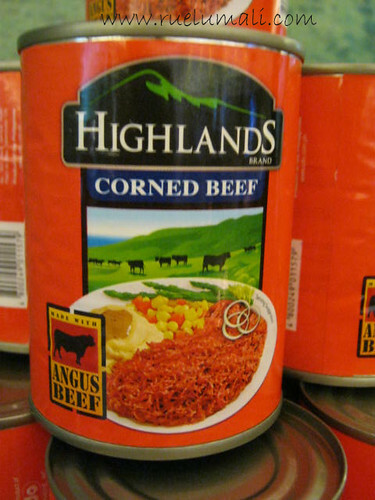 Highlands Corned Beef is the very first corned beef out there in the market that’s made with Angus Beef. Why Angus Beef? Because good beef starts with good breed and Angus is a premium breed of cattle that gives high-quality beef. 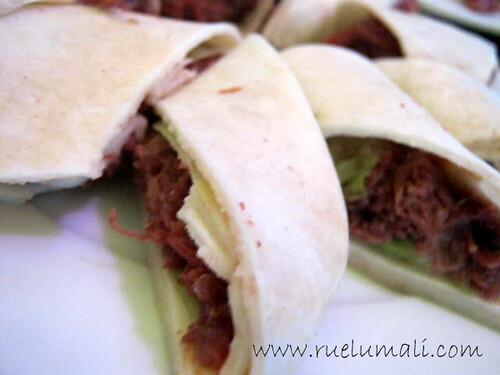 Highlands Corned Beef is filled with the rich beef taste of Angus and has long and juicy beef strands. Angus Beef has been identified as a beef priced at a premium due to its superior quality and taste. But now you can enjoy the premium taste of Angus beef without spending a great deal of money because Highlands Corned Beef is reasonably priced at only P41.50 per 180g. This food serving sandwich got out of the can without frying or putting anything. It has no artificial flavors and got this natural taste of Angus Beef. 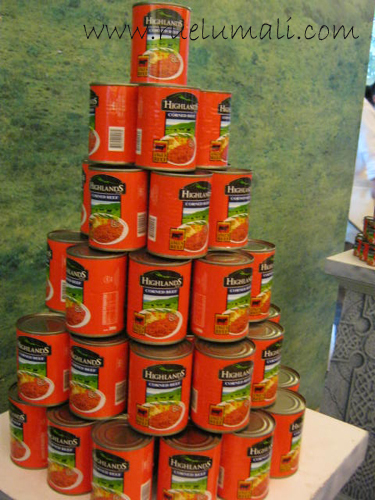 What makes Highlands Corned Beef to look for are their new breed of exceptional talents which represented by actor, Jake Cuenca, AZKAL’s very own, James Younghusband, filmmaker Paul Soriano, entrepreneur Luke Landrigan and dancer, Angelo Cacciatore which all of them like Highlands Corned Beef.